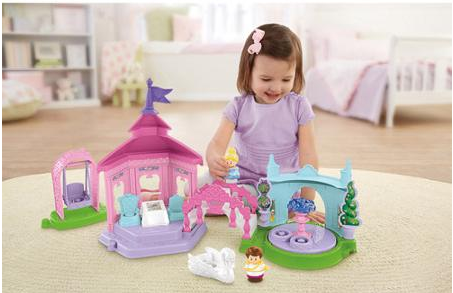 Hurry and snag your little princess this super cute Fisher-Price Little People Disney Princess Garden Party Playset for ONLY $22 (Reg. $40!) Shipping is FREE when you select Site-to-Store Pick Up (if available in your area)! Tea party toy includes gazebo with 2 chairs and table set for the garden party, courtyard with fountain and spinning dance floor, swan boat, bridge, swing that fits a figure and Little People Cinderella and Prince Charming figures.